This website is here to provide you a preview of our amazing property, but you have to see it to believe it. Located in the Berkshires of Western Mass., Santarella sits in one of the most peaceful and scenic valleys in the region, and yet is convienently located just a few miles off Exit 2 on Interstate 90. This makes Santarella easily accessible from both Boston (2 hrs.) and New York City (2.5 hrs.) Interested parties should feel free to contact us to arrange a showing. Santarella is the ideal setting to host your wedding or special event. Please contact us to obtain additional information or to arrange a showing. The history of Santarella dates back to 1739, when the town of Tyringham, Massachusetts was settled. Shortly after, the colonial home was built on the site. Its most famous resident was Sir Henry Hudson Kitson, the English sculptor who is known for the Lexington Minuteman and Plymouth Rock Maiden statues in Massachusetts, as well as a number of Civil War bas-reliefs and sculptures in Vicksburg, Mississippi. Kitson met and eventually married Marie Hobron, daughter of Benjamin Hobron and a well-liked woman in Tyringham. Around 1920, Kitson began his work transforming the barn on the property into a sculpting studio where he could work. It was this project which eventually became Kitson’s primary focus for the last 25 years of his life, and which consumed the remains of his earnings until he died a penniless man in 1947. He was knighted for his work in Romania, and remains an important figure in American sculpting. The most striking feature of Kitson’s studio is its 80-ton, asphault shingled roof. 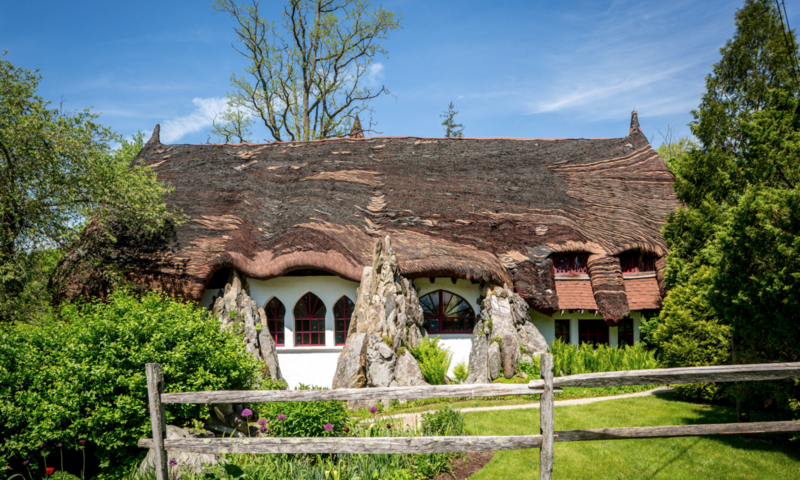 Originally, Kitson had envisioned created a rolling, thatched roof similar to the traditional thatched-roofs in his native Britain. He enlisted the help of several local farmers to grow a crop of Rye for the thatching, but the crop went bad, and he turned to asphault shingles to create the effect he desired. Each tile was hand-cut to a wave-like shape, and then was laid in thick layers of different-colored shingles. The whole project took three workers twelve years to complete. In addition to the roof, Kitson added large stained-glass windows throughout the building, and intricate shingling patterns to the exterior of the building. In front, he created carefully built piles of exotic stones, along with a freestanding stone chimney for the house. He moved and old grain silo to the property for an additional studio space, and liked it so much that he built another one like it from old barn wood he bought from local farmers. In the back, his full-time gardner created an elaborate garden with exotic plants, a stream, and a lily pond with goldfish? After Kitson passed away in 1947, Santarella was bought by the Davis family, who owned and operated the Tyringham galleries on the property until 1996. From 1996 to 2003, the Talbert-Atkins family ran the Henry Kitson Museum and Sculpture Gardens during the summertimes, in addition to hosting an artist-in-residence program here. The Hoefer-Brandmeyer family hopes to preserve the history of Santarella so that it can continue to enchant and be enjoyed by all who come here. For event and vacation rental inquiries, or to request additional information about Santarella, please feel free to contact us by phone or email. Santarella is not open to the public.